63 w w w . M o d e r n T i r e D e a l e r . c o m Since Continental tires are what come stock on Mercedes, Sarkis Motors estab- lished itself as a Continental Gold dealer and keeps several Continental and General tire sizes in stock. 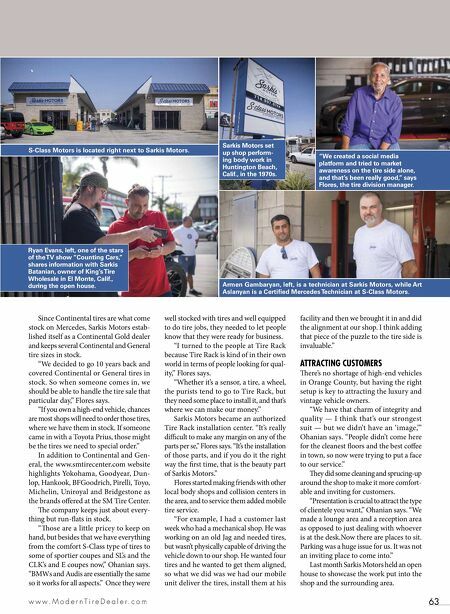 "We decided to go 10 years back and covered Continental or General tires in stock. So when someone comes in, we should be able to handle the tire sale that particular day," Flores says. "If you own a high-end vehicle, chances are most shops will need to order those tires, where we have them in stock. If someone came in with a Toyota Prius, those might be the tires we need to special order." In addition to Continental and Gen- eral, the www.smtirecenter.com website highlights Yokohama, Goodyear, Dun- lop, Hankook, BFGoodrich, Pirelli, Toyo, Michelin, Uniroyal and Bridgestone as the brands offered at the SM Tire Center. e company keeps just about every- thing but run-flats in stock. "ose are a little pricey to keep on hand, but besides that we have everything from the comfort S-Class type of tires to some of sportier coupes and SL's and the CLK's and E coupes now," Ohanian says. "BMWs and Audis are essentially the same so it works for all aspects." Once they were well stocked with tires and well equipped to do tire jobs, they needed to let people know that they were ready for business. "I turned to the people at Tire Rack because Tire Rack is kind of in their own world in terms of people looking for qual- ity," Flores says. "Whether it's a sensor, a tire, a wheel, the purists tend to go to Tire Rack, but they need some place to install it, and that's where we can make our money." Sarkis Motors became an authorized Tire Rack installation center. "It's really difficult to make any margin on any of the parts per se," Flores says. "It's the installation of those parts, and if you do it the right way the first time, that is the beauty part of Sarkis Motors." Flores started making friends with other local body shops and collision centers in the area, and to service them added mobile tire service. "For example, I had a customer last week who had a mechanical shop. He was working on an old Jag and needed tires, but wasn't physically capable of driving the vehicle down to our shop. He wanted four tires and he wanted to get them aligned, so what we did was we had our mobile unit deliver the tires, install them at his facility and then we brought it in and did the alignment at our shop. I think adding that piece of the puzzle to the tire side is invaluable." ATTRACTING CUSTOMERS ere's no shortage of high-end vehicles in Orange County, but having the right setup is key to attracting the luxury and vintage vehicle owners. "We have that charm of integrity and quality — I think that's our strongest suit — but we didn't have an 'image,'" Ohanian says. "People didn't come here for the cleanest floors and the best coffee in town, so now were trying to put a face to our service." ey did some cleaning and sprucing-up around the shop to make it more comfort- able and inviting for customers. "Presentation is crucial to attract the type of clientele you want," Ohanian says. "We made a lounge area and a reception area as opposed to just dealing with whoever is at the desk.Now there are places to sit. Parking was a huge issue for us. It was not an inviting place to come into." Last month Sarkis Motors held an open house to showcase the work put into the shop and the surrounding area. S-Class Motors is located right next to Sarkis Motors. Ryan Evans, left, one of the stars of the TV show "Counting Cars," shares information with Sarkis Batanian, owner of King's Tire Wholesale in El Monte, Calif., during the open house. Armen Gambaryan, left, is a technician at Sarkis Motors, while Art Aslanyan is a Certified Mercedes Technician at S-Class Motors. 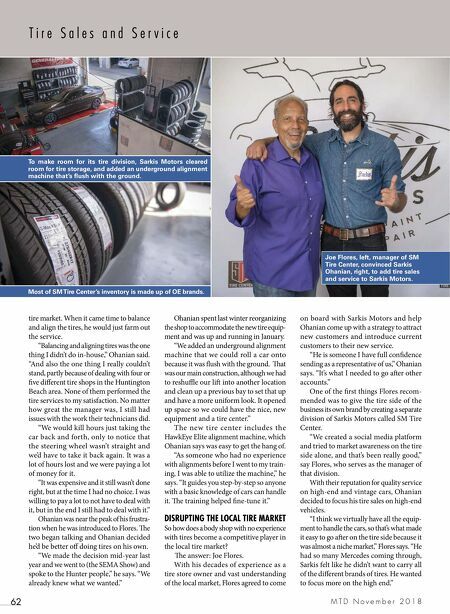 "We created a social media platform and tried to market awareness on the tire side alone, and that's been really good," says Flores, the tire division manager. Sarkis Motors set up shop perform- ing body work in Huntington Beach, Calif., in the 1970s.